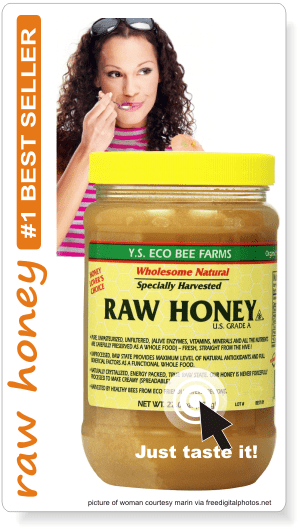 Acacia honey is very well known worldwide. But the term can be deceiving (just as tea tree is). European Acacia honey is a different product than the acacia honey made in Malaysia. In the US it is known as black locust honey or American acacia honey and in Europe as simply acacia honey but this is actually made from a false acacia, from a tree also known as black locust, on its scientific name “Robinia pseudoacacia”. 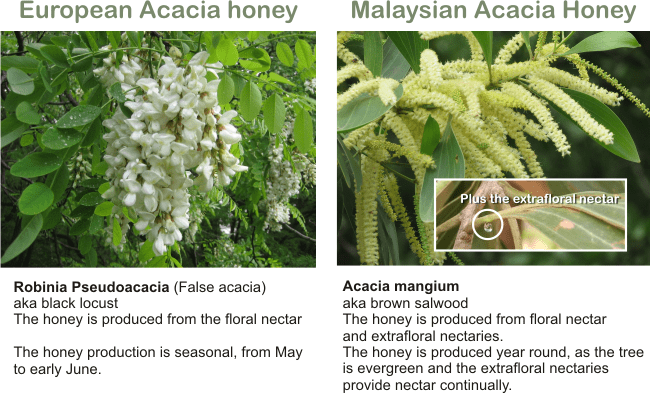 Real acacia honey from an acacia tree is produced from Acacia mangium, a species found more in Malaysia and Australia. Other names: sabah salwood, mangium, forest mangrove, hickory wattle, brown salwood, black wattle. In other languages: Filipino maber, Indonesian: tongke hutan, nak, mangge hutan; Polynesia: arr; Spanish: zamorano; Thai: krathinthepha, krathin tepa. Or as trade name for the timber: brown salwood. Distribution: The tree is native to Malaysia, South Africa, Thailand, Vietnam and northeastern Queensland in Australia but it has also been cultivated in the whole Australia, Indonesia and Papua New Guinea. nodules, in which the bacteria transform free nitrogen into organic and inorganic compounds containing nitrogen. The tree grows very fast, it can go from zero to a 50 cm (20 inch) diameter bole or trunk in just 9 years. Acacia mangium can add 35 to 50 cubic meters of wood per year per hectare in a good location, such as the plantation managed by Amazonia Reforestation. A 9 year old tree will be 21 meters of 65.5 feet tall. The timber is much appreciated because its density and fibre length allows the wood to be sawn, polished, drilled, glued and washed. The wood has a high tannin content (18% to 39%), meaning that it may become an important source for organic dyes as well. Flowers: Inflorescence is composed of many tiny white or cream flowers in spikes. Flowers are quinqeufloral; the calyx is 0.6-0.8 mm long, with obtuse lobes; corolla 1.2-1.5 mm long. Peduncles are canescent and pubescent, about 1 cm long; rachis is also canescent and pubescent. From the onset of flower buds to pod maturity is about 6-7 months. The tree is a hermaphrodite and generally outcrosses, with a tendency towards selfing. A. mangium starts to flower and produce seeds 18-20 months after planting. In its native range in Australia, flowers are present in May and the seeds mature in October-December. In Indonesia the fruits mature in July and in Papua New Guinea in late September. The germinating seeds can be cooked and eaten as a vegetable, they are high in crude protein content. The shoots and the phyllode leaves are also a crude protein fodder source for sheep and goats, though with low in vitro dry matter digestibility, so best eaten fresh. On the abaxial side of the basal part of every leaf stalks of Acacia mangium there are special nectar producing glands, called nectaries. The lens-like nectaries mature with the leaf, expanding with the development of the leafstalk and peaking at the stage at which the leafstalk itself has reached its mature size. According to a study conducted by Chunhua Zhang, in 2012, the nectary is composed of numerous small parenchyma cells and a nectar cavity in which the nectar is pooled. Those small parenchyma cells are divided into nectariferous tissue and epithelial cells, which line the lumen of the nectar cavity, and secretes the nectar into the same. Each nectary is surrounded by several vascular bundles, which probably afford the nectar. The team conducted by Chunhua Zhang analyzed the chemical constituents of the nectar by NMR, and showed it mainly consists of sugars with 60 % sucrose, 25 % glucose and 15 % fructose. 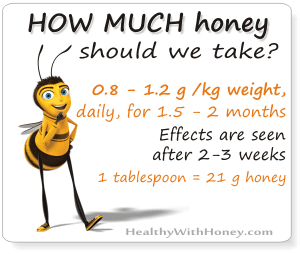 It’s a high quantity of sucrose if we compare it to the regular floral nectar. Pollinators are generally insects, Trigona and lots of Apis spp. being the active pollen vectors. They enjoy the flowers and after they are gone continue harvesting nectar secreted on leafstalks. This nectar is also a favorite of the Africanized bees, which are known for their aggressiveness, therefore plantation workers and others need to take extra care when gathering honey or confronting bees. Beehives in Acacia mangium plantations produce up to 110 kg or 242.5 lbs of honey per hive per year, which is important for local economies and employment. If you live near an acacia mangium forest than beekeeping is guaranteed success. The trees provide an ongoing source of nectar, which means no need for moving the beehives after the flowering period is over. Bees like the extrafloral nectar and gather it thus ensuring a monofloral type of honey. 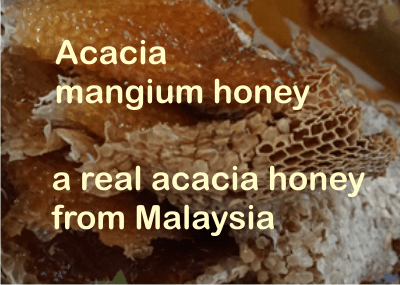 In Malaysia the most popular acacia mangium honey comes from the region of Borneo. The apiaries stretch on 37 km and are distributed in the depths of distant primitive jungle, breaking the usual traditional way of honey making. It is the world’s largest bee-keeping base stationed inside a rainforest, with 2 million acres of Acacia Mangium trees. The Borneo rainforest is the second largest in the world and one of the most unpolluted areas of our planet. It holds more than 140 million years of history and is attributed to creating more than half of the planets plant and animal species. 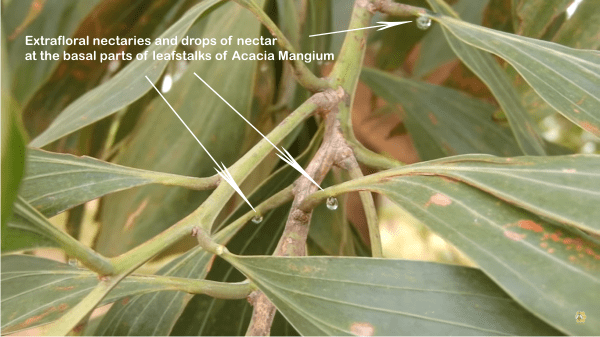 The forest owes its stability to Acacia Mangium which is wellknown for its fast growth and enriching properties that infuse nitrogen into the soil. Borneo acacia honey is completely organic. The use of synthetic pesticides, fertilisers, hormones, antibiotics and food additives, as well as the use of genetic engineering technology and the relevant products and their derivatives. are completely prohibited. The honey is continually tested at INTERTEK’s APPLICA honey products laboratory in Bremen, Germany. Filtration does not implies heating. They strain honey through a mesh that removes visible impurities such as insect parts (bees’ wings, legs etc.) and larger beeswax particles left over from the extraction process, while retaining the pollen. 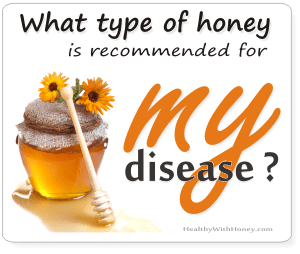 The study shows that compared to pineapple (nenas), Borneo acacia and tualang honeys, acacia honey is the most acidic and contains the highest total sugar, reducing sugar and apparent sucrose contents and the highest mineral content. Acacia honey contains the highest reducing sugar (63.89%) and sucrose content (4.51%), which contributes to its physical sweetness when compared to other types of Malaysian honey. 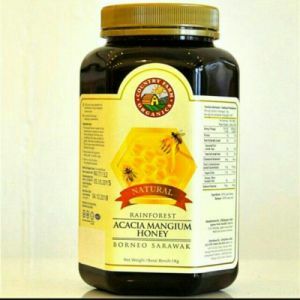 Borneo acacia honey has the highest concentration of total dissolved solids. As for the antioxidant properties of acacia honeys, the study showed they were the lowest, also confirming that the darker the honey the higher the antioxidant levels. Tualang honey had the highest phenolic compound and flavonoid contents with the highest ferric reducing power values as well as the greatest color intensity, indicating that it has the highest antioxidant potential. Due to its high mineral content acacia honey is recommended in anemia and boosting immunity. As any honey, acacia honey is good for our general state of health, for recovering after an illness or fatigue, its antibacterial and anti-inflammatory, speeds up the healing process (in burns and wounds), helps digestion, cleanses the liver and helps in respiratory issues, especially cough. Mix 2 spoonful of honey and 1/4 spoon of fresh lemon juice into a glass of water. Drink 3 to 4 glasses a day for colds or flue. Where can we find Acacia mangium honey? 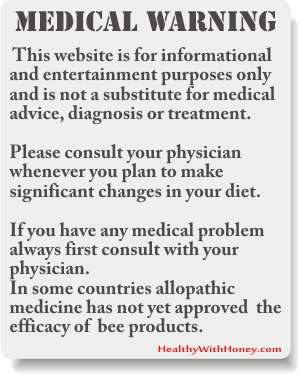 Borneo sells acacia honey and you can buy it from their website (unfortunately I don’t know if they sell internationally), yet it’s worth contacting them: borneoacacia.com. Or here: borneoforesthoney.com. Amazon doesn’t sell it. What is rubber honey? Fake manuka honey? 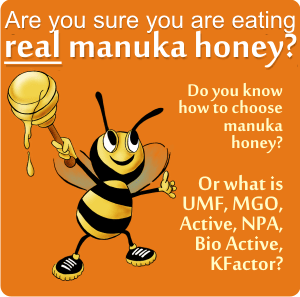 Here are the true markers of genuine New Zealand Manuka honey!